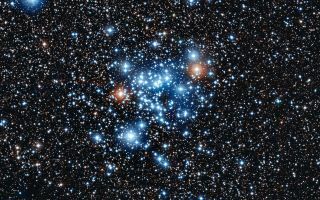 This spectacular group of young stars as seen in this space wallpaper is the open star cluster NGC 3766 in the constellation of Centaurus (The Centaur). This spectacular group of young stars as seen in this space wallpaper is the open star cluster NGC 3766 in the constellation of Centaurus (The Centaur). Very careful observations of these stars by a group from the Geneva Observatory using the Swiss 1.2-metre Leonhard Euler Telescope at ESO’s La Silla Observatory in Chile have shown that 36 of the stars are of a new and unknown class of variable star. This image was released June 12, 2013.